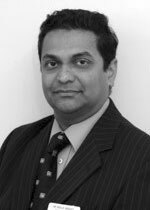 Mr Neville Menezes is a Consultant Surgeon practicing at Ashford & St. Peter’s hospital NHS Trust, Chertsey, Surrey. He was trained in the South Thames Deanery with Specialist training in General Surgery. He completed his FRCS from The Royal College of Surgeons, Edinburgh and thereafter pursued research & specialist training followed by an Intercollegiate FRCS (Gen. Surg.) in 2002. He trained as a Laparoscopic Fellow at The Laparoscopic Surgical Training Unit (MATTU), in Guildford and performs most of his operations laparoscopically. He has also sub-specialized in Hepatobiliary & Pancreas surgery having worked at King's College Hospital in London and the Pancreatic Unit at the Lister Department of Surgery. His Endoscopic Ultrasound Training was based at St Thomas’s Hospital in London. Mr Menezes will be performing all routine general surgical operations like excision of lesions (lumps & bumps, walk-in service), hernia operations (open and laparoscopic), gastrointestinal operations, operations for gallstone disease and acid reflux, gallbladder, bile duct surgery and pancreas surgery. His Endoscopic services include, OGD, colonoscopy, ERCP and endoscopic ultrasound. As well as upper and lower GI endocsopy, ERCP (Endoscopic Retrograde Cholangio-pancreatography) and EUS (Endoscopic Ultrasound, Diagnostic & Therapeutic) procedures are performed. Mr Menezes have carried out research and written publications in relation to gallstone disease, jaundice, cholecystitis, reflux and pancreatic disease. For more information on pancreatic cancer visit the Pancreatic Cancer Action website. Mr Neville Menezes does not hold a share or financial interest in this hospital, another Nuffield Health hospital or the company. Mr Neville Menezes does not have a share or financial interest in equipment used at this hospital or another Nuffield Health hospital. Mr Neville Menezes does not hold any paid advisory role(s) at this hospital or on behalf of Nuffield Health.